[ARCHIVED THREAD] - single point slings and attachment- lets see um! i redid my mak 90 awhile back, with much help from members here . i used a 74 style faux folder from midwest armory. long story short it didn't come with a swivel, so after much searching i finally just contactedwww.midwestarmory.com/ and asked, i overlook the easy road sometimes . they let me know a standard uncle mikes swivel fits right in the hole, the threaded bolt and nut kind. i got it at wally world for $10 last night. i also picked up an elcheapo sling -express sling. so my quandry now is after trying it out i realize the sling won't attach to my factory front sling attachment ring. so i begin fooling around with the idea of single point attacment. after five or six tries i got it where it hangs vertically muzzle down at my left side(i shoot lefty). it seems low but it is easy to bring up into ready position. the rig is sturdy enough and may turn out to do what i need of it. could any single point owners or just someone with acess to pics of them in use please post them. anyone know a link with pics of swangin' single point rigs? I don't know if there's really a lot of interest in single-pointing an AK, however I can see the need for tactical applications. It just seems that most AK users go with two or three pointers, at least the ones I know. I use a Blackhawk ZM single point sling, attached to the forward sling swivel mount positon on my vltor stock. This system works well, iam a lefty also and dont like 3 point slings for that reason. Larry Vickers speaks very poorly of single point slings as you can read here. I don't know enough about slings to really have an opinion, but when you read about Larry Vickers on his page, his opinion may become your opinion. LOL. thanks for the link dangeriousninja. from what he says , and the single points i've discovered for sale, i didn't realise what a single point sling was i just got a loop off of my rear swivel. a simple over the shoulder rig. it is interesting about the muzzle contacting the ground while kneeling though. i will revisit this post when i can take pics of where i'm at. 2 or 3 pointers didn't work for me because I'm a lefty, just seemed like they got in the way. I got a single point from Gear Sector, I love it. A little on the thin side(width-wise) but I don't carry it all the time so it's good for me. Do you have pictures of your AK and it's sling mounts? i don't have a pic with the rear swivel installed. but there is a hole just rear of the receiver , in the polymer "faux folder",that accepts a standard uncle mikes rifle mount. it can be installed either right or left side. the quick detach swivel isn't wide enough to accept the romy sling in pic. 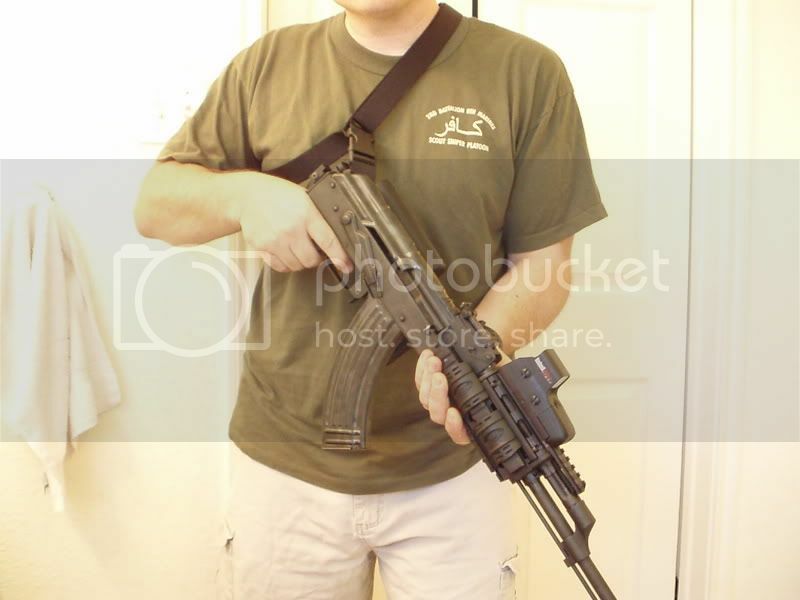 the front sling attachment is standard ak. How wide is the sling pictured? You can buy different sizes of the uncle mikes swivels. What size is the one you currently have? Easy way to attach the one point sling. That's a good read and so true about single points. I still love a 3pt on my AR. The single point gives me the most feedom of movement. And if your left handed then if you look close at the picture above, you will notice a small screw in place of where a swivel sling mount can go on the ACE folding adaptor.